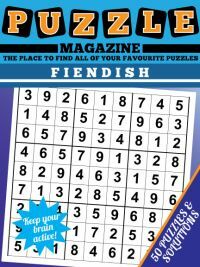 Our hidoku puzzle magazine contains 100 fantastic hidoku puzzles for you to enjoy. 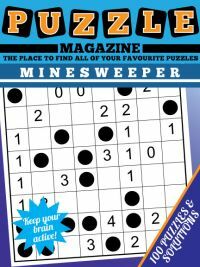 If you have just bought our hidoku magazine, or have come across this puzzle for the first time and are intrigued by it, this strategy tips guide is for you, explaining just what this puzzle is and how to play it. 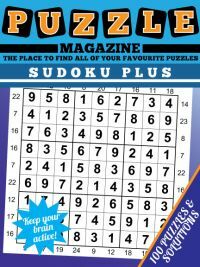 Have you never heard of hidoku before? Well, it is a journey based puzzle, and is sometimes called kings journey. 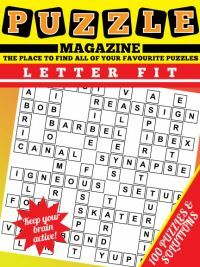 You may also have seen this puzzle type published under the name of hidato. The aim is to reconstruct a journey around the board starting at 1 and ending on 64, that visits each square just once along the path. 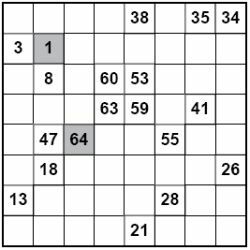 You must work out the order in which each square is visited, so you must place each number from 1 to 64 that does not already appear in the grid on it once, in the right place. The rules are that you may only move one square in any direction at a time. This is why this puzzle is often called kings journey - because the moves allowed are those of the king piece in chess as it traverses the board. Solving tips and strategies are simple for this puzzle and intuitive, but they are worth spelling out in more detail. The simplest strategy is to scan the grid at the start for easy moves - those that can only go in one cell in the grid. Thus we see that the givens 53 and 55 are separated and there is only one possible square that the 54 can go in - row 4 column 6 (henceforth R4C6) and so we can place it there. These easy pickings are important as they help to whittle down the options for various cells quickly. Whilst solving a puzzle many find it useful to draw a thin line through each cell to 'trace out' the path or route, this provides an instant visual representation of the journey and can help you to quickly spot areas of the journey that are missing and complete. Another useful rule is that of isolation: if placing a value would make it impossible to continue the journey or isolate some other parts of it, then that is clearly against the rules. Remember that you must both be able to get out of a cell and into it (apart from the grey coloured first of last cells where of course you just need to do one of those things). Look again at the grid to see a simple example of this. Imagine that we've placed a '2' at R3C1. That would mean that the 4 had to be placed either at R1C1 or R1C2. However, it would actually have to be at R1C1, because if we placed it at R1C2 then there would be no way to get both into AND out of R1C1: as soon as we placed the 4 in it we would be stuck. So the 4 would have go to in R1C1 if it happens that the 2 goes in R3C1. Being aware of this type of logic whilst solving the puzzle can help you to solve it correctly. With hard puzzles you might find it useful to make little notes of which numbers can go where; often there will be two possible options for a value. Whilst you rarely need it, using trickier logic can make things quicker to solve. If you know a value must be in one of two cells, but you don't know which, then any potential route for two other numbers that passes through both candidates clearly is not possible, as you know one of the two cells must contain a value that is not in that route. For instance, you know that 27 must be at R6C7 or R7C7. Therefore we know that the route from 21 to 26 is *not* R8C6, R8C7, R7C7, R6C7, because that route goes through both cells that could possible be 27. 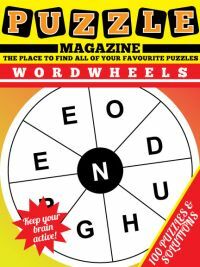 Now you've read the strategy tips, why not buy the hidoku magazine and enjoy 100 puzzles!